The Chairman of the Lagos State Branch of the Nigeria Union of Road Transport Workers, Tajudeen Agbede, announced on Monday that the union would join the planned NLC strike if government and labour fail to resolve their differences. “We are an affiliate of the NLC, we shall obey its directives. So, we have no choice than to join the strike anytime we’re called upon to do so,” Agbede told the transport correspondent of the News Agency of Nigeria in Lagos. Nigerians are waiting anxiously to know the outcome of a last-minute dialogue between government and organised labour over a nationwide strike scheduled for Tuesday November 6 by labour unions, arising from disagreements with government over a national minimum wage. Labour has demanded N30,000 but the Federal Government insists it can only pay N24, 000 while state governments offered to pay N22,500. Public sector workers in Nigeria are among the least paid in the world, although political office holders in the country, including members of the country’s bicameral parliament earn some of the biggest wages in the world. Also speaking on the strike, the District Manager of the Nigeria Railways Corporation, Mr. Jerry Oche, said that the company would not operate if the proposed strike got underway. “We are not going to operate if there is strike. 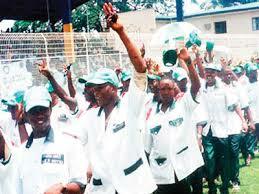 But if there is no strike we will operate but we wish the situation is resolved before tomorrow,” Oche said. Mr Fola Tinubu, Managing Director of Primero Transport Services Ltd., said that the company’s buses would operate strike or no strike. “Yes, we are operating tomorrow,” Tinubu said. Suleiman Jafo, Chairman of the Nagari Nakowa Motorcycle Owners and Riders Association, told NAN that members of the body would operate, provided movement was not restricted. “We are not salary earners. We eat from our daily operations,” Jafo said. A tricycle operator, Mr Jude Eze, said that although tricycle operators were in solidarity with labour over the minimum wage, they would have no choice than to operate, unless movement was disrupted. On his part, Mr Role Odukale, Chairman of the Red Bus Rapid Transit and Chief Operating Officer of Ise Oluwa Transport Company, said that his company’s bus drivers had been told not to operate if there was strike. “The drivers said they are not going to work as directed by their union. “We are just their employer, they belong to a union and we cannot work against their union,” Odukale said.